^ Ogg Encapsulation for the Opus Audio Codec. IETF. 2012-07-16 [2012-09-12]. ^ Network Working Group. RTP Payload Format and File Storage Format for Opus Speech and Audio Codec. Opus codec. IETF. July 4, 2011 [October 26, 2011]. ^ 3.0 3.1 Jean-Marc Valin; Gregory Maxwell; Timothy B. Terriberry; Koen Vos. High-Quality, Low-Delay Music Coding in the Opus Codec (PDF). www.xiph.org. New York, USA: Xiph.Org Foundation: 2. October 17–20, 2013 [19 August 2014]. CELT's look-ahead is 2.5 ms, while SILK's look-ahead is 5 ms, plus 1.5 ms for the resampling (including both encoder and decoder resampling). For this reason, the CELT path in the encoder adds a 4 ms delay. However, an application can restrict the encoder to CELT and omit that delay. This reduces the total look-ahead to 2.5 ms.
^ IETF working towards royalty-free audio codec. H-online.com. 2009-11-13 [2016-04-07]. ^ Vos, Koen. Harmony became Opus. codec (邮件列表) (IETF). 2010-10-15 [2016-01-03]. ^ IETF Opus codec now ready for testing. Hydrogenaudio. [2012-09-12]. ^ 7.0 7.1 Valin, Jean-Marc. IETF update, Mozilla. LiveJournal.com. 2011-08-01 [2012-10-05]. （原始内容存档于2011-11-11）. ^ Opus Codec. Xiph.org Foundation. [2012-09-12]. ^ [opus] Release candidates for 1.0.0 and 1.0.1 are available. opus (邮件列表) (Xiph.org Foundation). [2012-10-05]. ^ It's Opus, it rocks and now it's an audio codec standard!. Mozilla Hacks. [2012-09-12]. ^ RFC 6716 on Definition of the Opus Audio Codec. announce (邮件列表) (IETF). [2012-09-12]. ^ 12.0 12.1 Monty; Valin, Jean-Marc. Opus update 20131205: 1.1 Release. ^ Maxwell, Gregory. 64kbit/sec stereo multiformat listening test — unofficial results page. Xiph.Org Foundation. 2011 [2011-06-19]. ^ Next-Gen Low-Latency Open Codec Beats HE-AAC, Slashdot-Meldung vom 14. April 2011. ^ Valin, Jean-Marc; Vos, Koen; Skoglund, Jan. Hoene, Christian, 编. 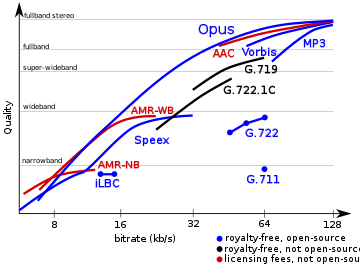 Summary of Opus listening test results. Internet Engineering Task Force. 2013-05-17 [2015-06-30]. ^ Kamedo2. Results of the public multiformat listening test. July 2014. ^ Lutzky, Manfred; Schuller, Gerald; Gayer, Marc; Krämer, Ulrich; Wabnik, Stefan. A guideline to audio codec delay (PDF). In AES 116th convention, Berlin, Germany. 2004: 8–11 [21 December 2016]. ^ Lironi, F.; Masseroni, C.; Trivisonno, R.; Ball, C. F. Multi RAB-based multimedia services over GERAN mobile networks. Vehicular Technology Conference, VTC-2005-Fall. IEEE 62nd. 2005, 3: 1662–1666 [30 October 2012]. ^ Carôt, Alexander. "Low Latency Audio Streaming for Internet-Based Musical Interaction" in Streaming Media Architectures: Techniques and Applications: Recent Advances. IGI Global. 2010: 362–383. ISBN 978-1-61692-833-9. ^ YE, NONG, VAN CHEN, and TONI FARLEY. "Qos Requirements Of Multimedia Data On Computer Networks". Proceedings of the Second International Conference on Active Media Technology, Chongqing, PR China, 29–31 May 2003. World Scientific Publishing Company Incorporated. 2003: 183–189. ISBN 978-981-238-343-3. ^ Montgomery, Christopher. A quick showcase of the bleeding edge... CELT 0.10.0 @ constant PEAQ value, varying latency. CELT v0.10 (latest prior to Opus integration). xiph.org. [30 October 2012]. ^ Git – ffmpeg.git/commit. Git.videolan.org. [2017-08-23]. ^ Git – GStreamer/gst-plugins-base. [26 October 2017]. ^ lostromb/concentus: Pure Portable C# and Java implementations of the Opus audio codec. GitHub. [2017-08-23]. ^ Tieline Integrates OPUS into Report-IT and IP codecs. Radio Magazine. 2012-12-18 [2012-12-18]. （原始内容存档于2013-05-09）. ^ GStreamer: news. Gstreamer.freedesktop.org. [2012-10-05]. ^ Audio Codecs. FFmpeg General Documentation. [2014-05-28]. ^ Audio Codecs. Libav General Documentation. [2014-05-28]. ^ Google. Android Lollipop. Google. [2015-11-03]. ^ Supported Media Formats. Google. [2015-04-29]. ^ Google. Issue 80729: Opus support not working.. code.google.com. [2016-04-19]. ^ lavfilters — Open-Source DirectShow Media Splitter and Decoders. Google Project Hosting. [2012-10-05]. （原始内容存档于2013-01-03）. ^ 38.0 38.1 Android 7.0 (N) Compatibility Definition. Google. [2017-05-22]. ^ AIMP: Home Page. Aimp.ru. [2012-10-05]. ^ Amarok 2.8 "Return To The Origin" released. Amarok. 2013-08-16 [2014-05-28]. ^ foobar2000 v1.1.14 beta. Hydrogenaudio Forums. [2012-10-05]. ^ MusicBee. MusicBee Forum. [2013-08-17]. ^ VLC 2.0.4 Twoflower. VideoLAN. [2012-10-19]. ^ Winamp. Winamp Forums. [2013-01-04]. ^ Icecast 2.4 beta release. Lists.xiph.org. [2012-09-12]. ^ Airtime, Changelog. Airtime/changelog at 2.4.x. Sourcefabric. [1 July 2013]. ^ Radio Jackie, Listen Now. Opus Stream. Radio Jackie. [14 May 2013]. ^ Absolute Radio, Listen Labs. Opus Streaming Trial. Absolute Radio. [30 October 2012]. ^ Steam Beta Update: SteamVR and In-Home Streaming Beta. SteamDB. [9 December 2015]. ^ Zwei Audio-Codecs für Echtzeit-Kommunikation im Browser. Heise.de. [2012-09-12]. ^ Media formats supported by the HTML audio and video elements. Developer.mozilla.org. 2012-09-03 [2012-09-12]. ^ Issue 104241: Support OPUS in Ogg files for the audio tag and Audio object. Chromium bug tracker. [2014-05-28]. ^ Why no official mention of Opus support?. My.opera.com. 2012-07-19 [2012-09-12]. ^ Shankland, Stephen. How corporate bickering hobbled better Web audio. CNET News. 2012-08-17 [2012-09-12]. ^ Platform status. Microsoft. 2016-04-19. ^ WebM, VP9 and Opus Support in Microsoft Edge. Microsoft. 2016-04-18. ^ Bocquet, Ludovic. Jitsi 2.0 Now Released!. XMPP Foundation. 2013-03-07 [2014-05-28]. （原始内容存档于2014-05-29）. ^ A new Line2 for iOS experience with improved sound quality. Line2. 2012-10-18 [2013-03-15]. （原始内容存档于2013-03-15）. ^ SFLphone — Task #14602: [Codec] Implement opus. Savoir-faire Linux. 2012-08-13 [2012-09-12]. （原始内容存档于2012-12-17）. ^ What Features Does Discord Have?. Discord. [2017-10-29] （美国英语）. ^ Brandon. Mumble 1.2.4 Has been released. Mumblevoice Blog. 2013-06-19 [2014-05-28]. （原始内容存档于2014-06-28）. ^ TeamSpeak 3 Client 3.0.10 released. TeamSpeak Forums. [2013-03-04]. ^ TeamSpeak 3 Server Version 3.0.7 released. TeamSpeak Forums. [2013-03-04]. ^ TrueConf сделал ставку на аудиокодек Opus [TrueConf opted for Opus audio codec] (新闻稿). Moscow, Russia. 2012-09-19 [2014-05-28]. （原始内容存档于2014-05-29） （俄语）. ^ Jordan, Matthew. Opus and VP8. asterisk-dev (邮件列表). 2013-05-29 [2014-05-28]. ^ Asterisk Opus/VP8 patch. GitHub. [2014-05-28]. ^ Opus for Asterisk. Inside the Asterisk. 2016-09-30 [2016-10-03]. ^ Tox codec handling source code. GitHub. [2015-12-09]. ^ Classified-ads audio encoder documentation. [2016-05-25]. ^ Open Source Software used in PlayStation®4. Sony Interactive Entertainment Inc. [2017-12-11]. ^ Rockbox Contributors. Release notes for Rockbox v.3.13. Rockbox. 2013-03-05 [2013-03-21]. ^ RockboxAsAnApplication2010 < Main < Wiki. Rockbox.org. [2012-10-05]. ^ PULSE FLEX. BlueSound. [28 February 2017].